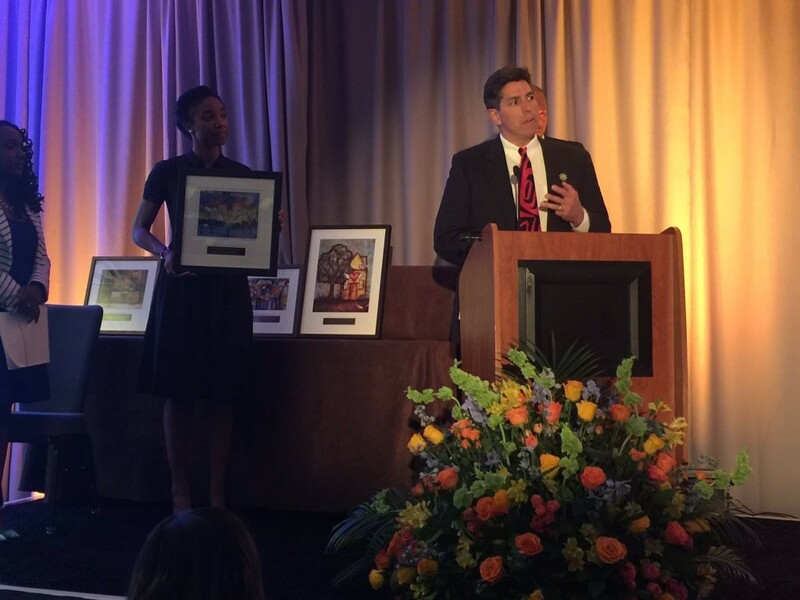 Michael E. Roberts, President and CEO of First Nations Development Institute, was honored in Washington, D.C. on April 20 with an “Asset Builder Champion” (ABC) award from the Center for Global Policy Solutions. 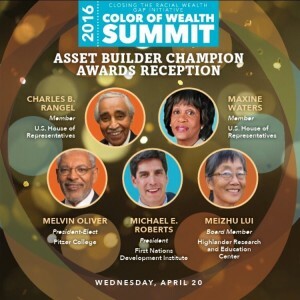 The award ceremony was part of the 2016 Color of Wealth Summit, which is an effort under the Closing the Racial Wealth Gap Initiative. Besides Roberts, the other ABC award recipients were U.S. Reps. Maxine Waters and Charles Rangel, Pitzer College President-Elect Melvin Oliver, and Highlander Research and Education Center Board Member Meizhu Lui. 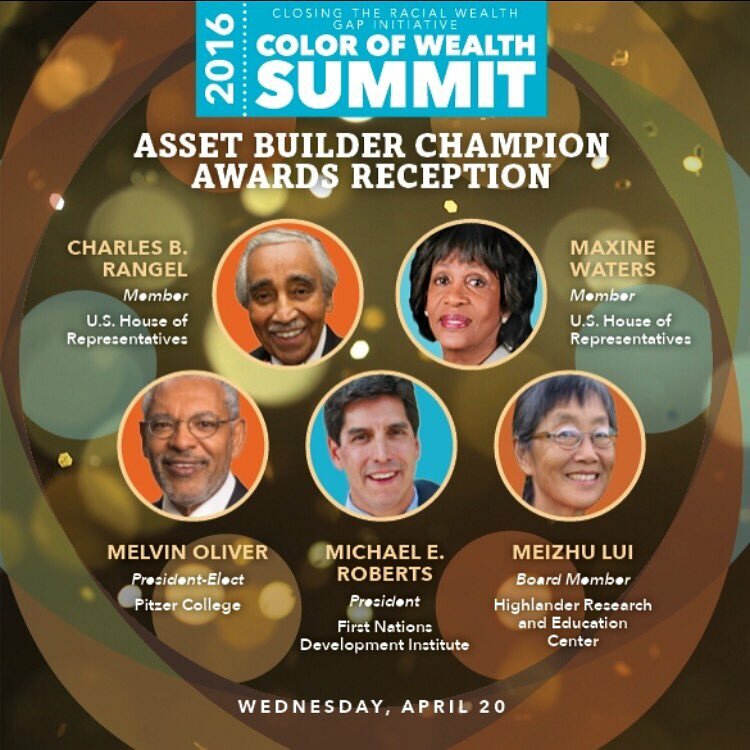 They were honored for their significant contributions to addressing racial wealth disparities nationwide. Roberts, who is Tlingit, was appointed president of First Nations in 2005 after returning to the organization in 2003. He served previously as First Nations’ chief operating officer until 1997. In the interim, he worked in private equity, providing services for angel investors, a telecommunications fund, and a venture capital firm. He also worked at Alaska Native corporations and for local IRA councils. He taught a graduate course on venture capital at the University of Missouri (Kansas City) Bloch School of Business and an undergraduate entrepreneurship course at Haskell Indian Nations University. He serves on the board of First Nations and is chairman of the board of First Nations Oweesta Corporation. He is a steering committee member of the Sustainable Agriculture and Food Systems Funders Network and on the investment committee for the Three Affiliated Tribes. Roberts has held other advisory positions including as a board member for Native Americans in Philanthropy. The Center for Global Policy Solutions is a 501(c)(3) think tank and action organization that labors in pursuit of a vibrant, diverse and inclusive world in which everyone has the opportunity to thrive in safe and sustainable environments. Its mission is to make policy work for people and their environments by advancing economic security, health, education and civic success for vulnerable populations. Its target groups include people of color, women, children and youth, older adults and low-income populations. This entry was posted in Uncategorized and tagged Center for Global Policy Solutions, Charles Rangel, Closing the Racial Wealth Gap Initiative, Color of Wealth Summit, First Nations Development Institute, Maxine Waters, Meizhu Lui, Melvin Oliver, Michael E. Roberts, Mike Roberts, Oweesta, Tlingit, wealth disparities by rblauvelt. Bookmark the permalink.